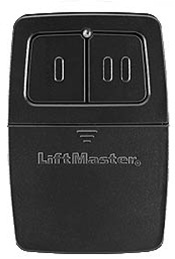 Universal Remote Control If you need to replace a lost or broken remote control, or just want to complement your existing garage access system, the new LiftMaster® Universal Remote Control is the perfect single-source solution. It is designed to work with a variety of brands of garage door openers to give you convenient, secure access to your garage and home. With it, you can operate two different garage door manufacturers and/or frequencies at the same time, so it's like having two remote controls in one. A single coin cell battery is included. If you need to replace a lost or broken remote control, or just want to complement your existing garage access system, the new LiftMaster® Universal Remote Control is the perfect single-source solution. It is designed to work with a variety of brands of garage door openers to give you convenient, secure access to your garage and home. With it, you can operate two different garage door manufacturers and/or frequencies at the same time, so it's like having two remote controls in one. A single coin cell battery is included.